Mayrich Black Bear Rain Gauge by Mayrich at Grow Website. MPN: 52636. Hurry! Limited time offer. Offer valid only while supplies last. 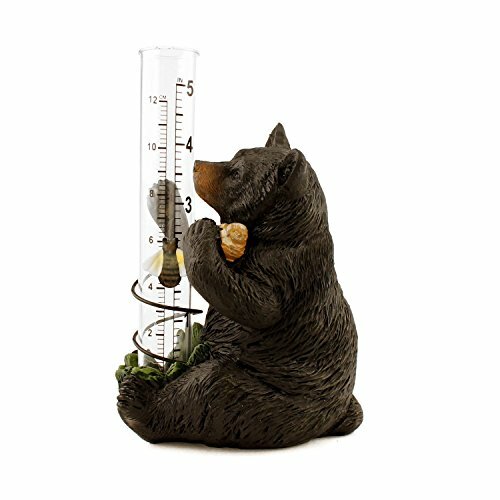 For those who want to keep track of rainfall levels or just want a cute garden accessory, this adorable black bear rain gauge is perfect for you. View More In Rain Gauges. For those who want to keep track of rainfall levels or just want a cute garden accessory, this adorable black bear rain gauge is perfect for you. Crafted from durable, weatherproof resin, you'll be delighted by the intricate, lifelike detailing. A metal coil is attached to hold the plastic rain gauge in place and measures both inches and centimeters. You will receive one of two styles selected at random. Measures approx. 5.5" tall x 3" wide x 4" long and measures 6" tall when the rain gauge is inserted. Crafted from durable, weatherproof resin. A metal coil is attached to hold the plastic rain gauge in place. Measures both inches and centimeters. You will receive one of two styles selected at random. Measures approx. 5.5" tall x 3" wide x 4" long and measures 6" tall when the rain gauge is inserted. If you have any questions about this product by Mayrich, contact us by completing and submitting the form below. If you are looking for a specif part number, please include it with your message. Generic er Gaug Sand Filter lter Gau Pool Spa Pump nd Filter G 0-60 psi Water Pool Sp Gauge 5142 ressure Gaug Pressure Gauge 1/4"